Okki Nokki RCM: An affordable record cleaning machine. According to the press release, the Okki Nokki RCM offers unbeatable value for money. Priced at about €350,- (£435,-), it is a compact yet powerful piece of kit whose build quality, features and performance might reasonably be expected to come with a considerably higher price tag. Originally conceived around 15 years ago by Dutch designer Johan Bezem, its design and construction have steadily and deliberately evolved over time, adding a raft of enhancements while keeping the price firmly in check. 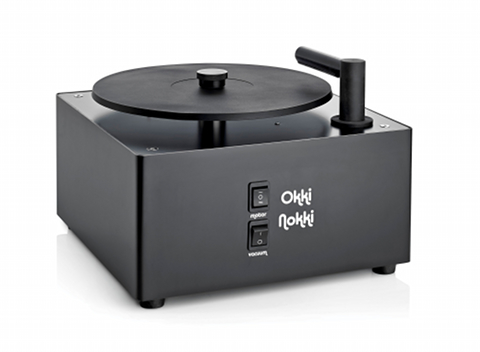 Compact, sleek in appearance and surprisingly light for a record cleaner, the Okki Nokki features a quiet-running vacuum motor, the ability to spin in both directions and a float mechanism that stops it operating when the fluid needs to be drained. The machine comes complete with its own concentrated cleaning fluid and a goat-hair brush – everything you need to get straight down to the business of bringing your beloved records back to pristine condition. Operation is via two switches: one for forward/reverse and the other for suction.